As I filled up my MINI a couple of days ago, I glanced at the pump and noticed the price of the premium gasoline: $2.77 per gallon. I couldn’t believe it. 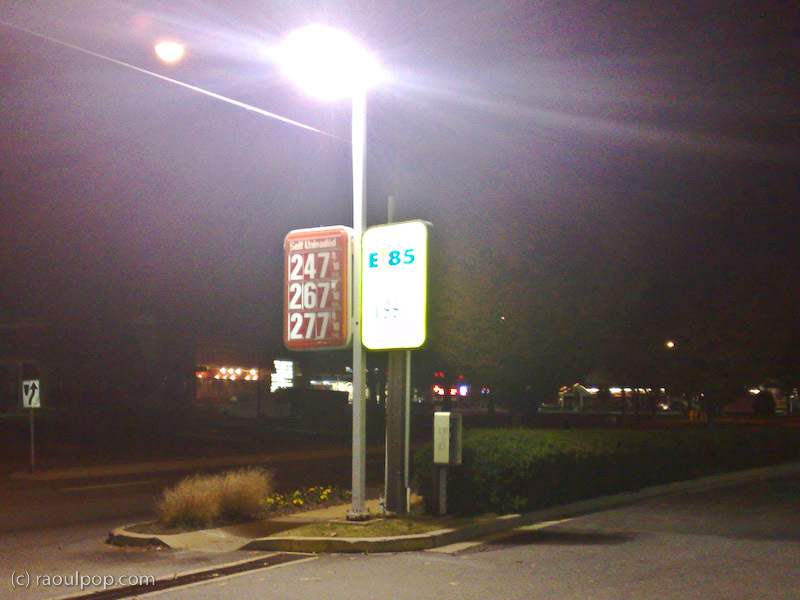 I left the pump running and ran toward the street sign to take a photo. I just didn’t think I’d ever see premium gas dipping below $3 again. While I’m sure others welcome the change — and I can’t say I disagree when you consider the issue solely from the point of view of one’s bank account — I still say gasoline needs to stay above $3 at the pump, in order to encourage proper driving behavior and to make research into alternative fuels and technologies viable. It wasn’t that long ago that I paid $4.45 at the pump to buy premium gasoline for my MINI. There’s a huge difference between $4.45 and $2.77, and I don’t like this sort of yo-yo behavior when it comes to gas prices. First it was too high, and now it’s too low. It’s not right. It needs to stabilize somewhere between $3-4 dollars per gallon, preferably somewhere between $3.00 and $3.50. If you’d like to read more about my thoughts on a gasoline tax (which isn’t a new idea, but already in use in Europe), see this post from March of 2005. I took the photo above with my Nokia N95.